Disney recently announced it has bought Lucasfilm for a whopping $4 billion. That means it gets the rights to the Star Wars franchise (aside, apparently, from Episode IV, whose rights belong to Fox), as well as Indiana Jones, Industrial Light & Magic, Lucasgames, etc. Disney also mentioned plans to make Star Wars Episodes VII, VIII and IX--which would not be written or directed by George Lucas, the man responsible both for the iconic original trilogy and the wretched, childhood-tainting prequels. We ask each of our bloggers to tell us: is this idea good, bad or ugly? UGLY: There's an upside and a downside here. The up is that Lucas won't be able to Jar-Jar any more STAR WARS movies, and maybe with his finger off the switch, Disney will finally release the films in their original form, without all the Greedo shooting first business. The downside, contrary to popular sentiment, is not that Disney will screw it up. Lucas proved totally capable of doing that himself. The downside is that Walt Disney studios has been releasing fewer and fewer films each year (only 7 last year, 6 this year), so now what we're looking at is a two-year cycle of 12 films where 2 Marvels, 2 Pixars, 1 Disney Animation, 1-2 Tim Burtons, and now a STAR WARS are already taking up over half of the slate and about a billion dollars in budgeted production costs. What this move means overall is that fewer films will be made, there will be fewer surprises, and fewer chances for anyone to ever again blow up the cinematic landscape like Lucas did with the original STAR WARS. GOOD: Though the prequels did improve, film to film, overall they were a disaster. The tinkering Lucas has done to the original trilogy, if anything, has been worse. All of this goes back to a fundamental misunderstanding on his part about what people liked in the original trilogy to begin with--they were grand fantasies that tapped into narrative themes and symbolisms that animate nearly all mythic traditions, from Gilgamesh to Lord of the Rings. And they were set in space! Sure it was a fake version of space where there are audible sounds and many laws of physics are not applicable, but whatever. These were good stories set in an interesting “world” populated by memorable, believable characters. I was half-convinced that Chewbacca was real. Enter the prequels, which peed on that. Then enter the revisions to the original trilogy, in which we get corny, quickly-dated CGI, Greedo shooting first...and...no “Yub Nub” at the end of Jedi! GEORGE LUCAS I WILL NEVER FORGIVE YOU FOR THIS. Disney might be able to do some good here: they’ve done a decent job with Marvel (so far), and given that the STAR WARS franchise is riding a decade-and-a-half long waterslide to the gutter, it won’t take much at this point to right the ship. Mixed-metaphors aside, all it will take is putting the right people on the project. What’s Lawrence Kasdan up to these days? GOOD: I can't wait for Leia to be considered a Disney Princess. (Hipster Leia, why didn't I think of that for Halloween?!) Frankly, it's about time that someone took Star Wars away from George Lucas. Disney understands they hit the jackpot with Joss Whedon taking on Marvel. Even though Dark Shadows was pretty awful, Disney’s still right to trust Tim Burton and his track record. So this is all about who will lead up the project, both directing (my votes go to J.J. Abrams, John Favreau, or Christopher Nolan) -- but more importantly, the writing. The characters and the stories have always been rich (Lucas does some things right, like ripping off every biblical and mythical archetype in the books to great effect), but thank Kenobi that Lucas won’t be in charge of the dialogue anymore. The painful and awkward dialogue has been proliferating throughout the galaxy since Episode 1 and persists in Clone Wars. Let's get David Mamet, Aaron Sorkin, Quentin Tarantino, and Seth freaking MacFarlane in the same room with a bunch of light sabers and see what happens. As long as Disney keeps the swipe transitions I’ll be happy! GOOD, BAD, maybe UGLY: So, we can all agree that the prequel were terrible. But, if we’re being absolutely honest, the originals weren’t that great either. GOOD: George Lucas has already ruined the beloved franchise that I grew up with. He added unnecessary sequences to the original trilogy and created a new trilogy that is laughable. How can Disney do any worse? My take is that Disney will take the brilliant world that Lucas created and treat it with care. Under the watchful eye of Disney I could see more of a Star Wars presence in its theme parks and could see it expanding the successful Cartoon Network’s Clone Wars. Anyone who has been watching the Clone Wars knows that the Star Wars franchise has a lot of quality stories to be told. I feel that removing Lucas from the picture may really open the creative envelope on a world ripe with opportunity. I for one am on board. GOOD: George Lucas was brilliant in coming up with STAR WARS, and created a memorable world and fantastic characters. That said, the last four movies (including Revenge of the Jedi) left much to be desired. Lucas, that is, really screwed up his own series. It has long been time for Lucas to give up control. We should be jumping for joy that the series is out of Lucas’s hands! In selling to Disney, he gives a strong brand to a company that has the resources and the experience to make the most of it. 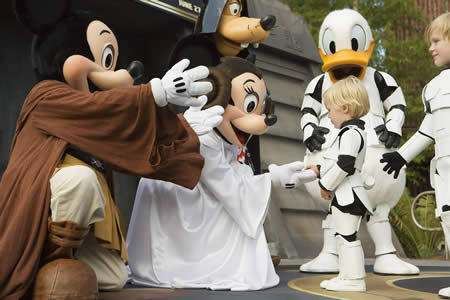 Disney can breathe new life into the STAR WARS brand. Of course, this depends on Disney’s selection of screenplays. Should they adapt the next movies from Timothy Zahn’s Heir to the Empire Trilogy (also known as the Thrawn Trilogy), we should expect to see renewed interest in and love for the STAR WARS franchise. With the right director and screenplay, I would be more interested in the Heir to the Empire Trilogy than I was in the original series! BAD: I seem to be the lone wolf here, but I’m literally a STAR WARS baby. I was born two weeks before it came out (May 11[me]-May 25, 1977[Star Wars]) and I’ve been a lifelong lover of all things Star Wars. I’ll admit that Jar-Jar was worse than Ewoks and Jake Lloyd was a terrible choice for young Anakin, but I still get goosebumps when that door opens and Darth Maul fires up his double-edged lightsaber. Come on, admit that was cool. You know it was. The reason I chose “Bad” was because Disney hasn’t made a good movie since The Lion King. That’s 1994, people. Although I have high hopes for Wreck-It Ralph, After nearly 20 years of disappointment, even a movie about video games has trouble getting me excited, and I’m the game reviewer! If they promise to turn it all over to Pixar, I might be okay with it. Get the Wall-E guys on the case. That was one of the more creative yet family friendly movies of the last few decades. 94% of Star Wars movies are CGI, anyway. Clone Wars looks pretty good and it’s a “cartoon.” Imagine what they could do with a Star Wars Episode 7 budget! I say we all just get down on our knees and pray to God Almighty that they don’t stick Harrison Ford in the role of Han Solo for #7! After Indy 4 you know he’ll do it if asked. Looking old and foolish doesn’t bother him a bit if the contract is big enough. I guess I probably wouldn’t care either if I got $65 million and a profit sharing deal. Get ready, folks. It’s something you never thought you’d see. Harrison Ford as a 70-year-old Han Solo. Those Pixar geeks are going to earn their money on this one!